Tuesday evening saw us back at the lake in Loughrea for another shot at the aquathon. 750m swim followed by a 'quick' transition and 5k run up the hill past the graveyard and back. Tonight was the first opportunity for Edel & myself to race together as until now, one or the other of us was 'shorelined' with the kids. This evening they were at home with their cousins and auntie. There was another great turnout with some 64 / 65 people taking part from both Predator & Galway Triathlon clubs on a mild evening perfect for racing. We all lined up along the pier wall and waited for the off. With a great stampede of splashing and churning water off we went. I hate these sort of starts as there is so many people crossing and meandering along in front of you that it is really difficult to get in a rhythm. I generally find my longer distance swim times are much more efficient than my sprint distance. I reckon this is because I spend so much time settling down at the start of the race, trying to find my rhythm. 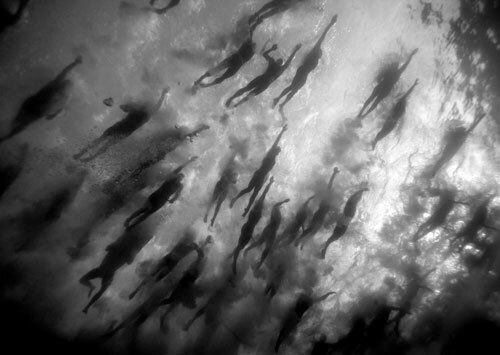 A great shot of a mass start. Knowing myself that I was much slower than normal at the start of this race, I sought my rhythm and settled down somewhat, still not enough and it was only in the return leg of the swim that I genuinely felt comfortable and easy. I'm hoping that the HRM info might back me up on this notion. Back to land and again I struggled with getting the wetsuit off my feet. No matter how must I do or don't Bodyglide this seems to remain a sticking problem. Into the shoes, iNOV-8 Road X 255, again not as easy as it should be, but then that's what practice races are for. My run, I was happy with. With no stride pod I had to go on instinct for pacing and found that I was really comfortable pushing myself along nicely. Knowing Edel was way ahead in the swim, I expected to see her ahead of me on the run. I didn't expect to see her with a km or so stuck into me on the run! When we passed I clocked it and found I had 2 minutes to the turn about, putting her 4 mins or so up at that point! With the return run being downhill for a lot of the route, I expected to pull back time but would not catch her within her 2k to the finish. I finished my run quite strong and would have liked the pacing data for feedback, but hey, we don't always get what we like.